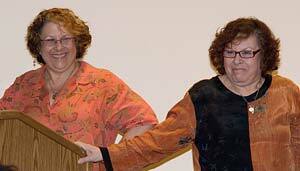 Emily Klainberg (left) and Barbara Feinstein (right) are identical twins who have quilted for about 12 years. They have been sewing, knitting and doing other needlecraft since they were young girls, when their mother taught them everything she knew. Emily got them started in quilting when she signed both of them to be in Judy Doenias' hand quilting class 12 years ago. They've been hooked ever since and have transitioned to working with a sewing machine. In fact, the knitting needles and crochet hooks have taken a back seat to the sewing machine. They take as many classes as possible, expanding their knowledge of all aspects traditional and art quilts. They have both been attending Quilting by the Lake for nine years and have honed their skills in all aspects of quilting. While Emily was working, Barbara usually finished her projects. Emily's excuse was that "I'm working!" Emily retired 7 years ago and is busier than ever, so she's still not finishing projects. Emily works at The City Quilter and they both teach there. They also teach craft classes for the Elder Craftsmen. While they are identical twins, their quilts are not. Barbara usually works in Japanese fabrics or muted tones and Emily's are as bright as they can be. They are also Dear Jane® fanatics. Their lives have been as different as their quilts. Barbara lived in Europe (England, Sweden and Italy) for 9 years and raised two sons while her husband worked for Unilever. When she returned to the USA she lived in Indiana and California before returning to the east coast in Stamford, Connecticut. During Barbara's movings, Emily stayed in New York City working for various City and State government offices and retiring in 2000. Both did knitting, crocheting, sewing (but not quilt making) and cooking. They report that their favorite time is when Emily stays at Barbara's house in Connecticut, or Barbara stays with Emily in New York City and they spend time working on quilts for their friends grandchildren, their grandchildren or just for themselves. One cuts, one sews, they give each other suggestions and before they know it a quilt is finished! "I finally finished the quilt!"